Watermelon is a versatile fruit and it's always fun to try something new. Here, we've mixed this lycopene-laden fruit with whole grain pancakes for a fun and filling breakfast. In small saucepan, heat maple syrup with butter until butter melts. 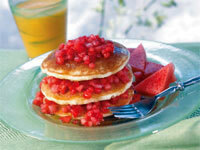 For service, place a hot pancake on a warmed plate; top with 1⁄3 of the syrup mixture and 1⁄2 cup chopped watermelon. Repeat layering syrup mixture, watermelon, and pancakes two more times.